In short, I absolutely adored this book and found it very difficult to put it down once I started reading. 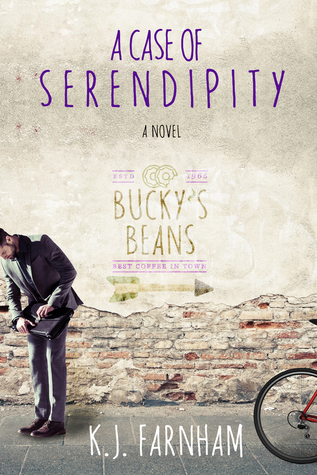 A Case of Serendipity is a contemporary light romance novel which focuses on Ruth, a quirky divorcee and Henry, a workaholic lawyer, who are thrown together by fate after Ruth becomes the lead plaintiff in a case against Bucky’s Beans Coffeehouse. The novel is a first person narrative and each chapter alternates between either Ruth or Henry’s point of view. This choice of narrative works well and gives the reader the opportunity to really get to know both of these characters who, thanks to Farnham’s flawless style and effortless descriptions, are extremely well drawn. Farnham has a real gift for creating likable characters, the sort of characters who make you want to go along with them for the ride, who make you want to root for them. Ruth and Henry are no exception and by the end of the novel I struggled to decide which I found more endearing; off-beat Ruth with her wild hair and appreciation of life’s simple pleasures, or Henry with his neatness, seriousness and intensity. The story itself is absolutely delightful – without giving too much away, this is a real ‘feel good’ novel, a genuine light romance about two people who seem to complement each other so perfectly that you can’t imagine them not ending up together. Whether they do or whether they don’t…well, you’ll just have to read it to find out. If you like romance without erotica, well-rounded, likable characters and uplifting plots then this book is for you. Highly recommended – five stars. A Case of Serendipity is Farnham’s fourth novel, and will be released on 20th March. It is available for Kindle pre-order at the special price of 99p on Amazon UK.